Could it have been London Sec? Did London’s gentlemen distillers get their inspiration from their friends, the vintners? Geraldine Coates investigates the leap from sweet to unsweetened gin. Throughout the early nineteenth century, when people drank gin, they were usually drinking what was called Old Tom, Geneva, Schiedam or Hollands, all, to some degree, copies of Dutch style genever, and very different from the gin we drink today. The term Old Tom is a bit of a curiosity. At the beginning of the nineteenth century, the gin sold in barrels to retailers was often accompanied by descriptors such as “Old Tom” or “Young Tom” and many brands carried a picture of a cat. What seemed to have happened over time was that, in much the same way, as Hoover became the common name for any type of vacuum cleaner, Old Tom became the generic name for gin. Only later did distillers use the term to signify sweetened gin. In the beginning, however, all gin was sweetened: first, because sugar very effectively masked fusel oil flavours in the base spirit; secondly, because popular taste leant toward sweetness. Over the course of the 18th century, sugar had become enormously popular. Britain, for example, consumed five times as much sugar in 1770 as in 1710. By 1750 sugar surpassed grain as the most valuable commodity in European trade — it made up a fifth of all European imports. The British developed a passion for sweet things in the form of jams and jellies and sweetmeats of all types. Some historians claim that Old Tom Gin was sweetened with liquorice and other sweet botanicals because sugar was expensive but I’m not sure there is any evidence for that. And the basic problem with this theory is that by the start of the 19th century sugar was cheap and available in vast quantities in the big cities like London and Liverpool. These cities were bastions of the infamous ‘Triangular Trade’ where British merchant vessels left British ports bound for West Africa laden with trade goods. Once there they exchanged their manufactured geegaws for kidnapped African slaves and sailed across the Atlantic to British colonies in the Caribbean where they sold the slaves and picked up sugar, tobacco and spices. So huge was the trade that in 1803 the purpose-built West India Docks in London opened. Financed by a group of powerful merchants and businessmen involved in the sugar trade it was then the biggest engineering project in the world, designed to allow ships from the West Indies to unload their valuable cargoes without queuing and delays. In nearby Silvertown sugar refining became an important industry with Tate and Lyle operating a huge factory there from the 1860s. Indeed, the company is still a major presence in the area. Given the availability of sugar, it’s far more likely that most distillers simply added it to their recipes for Old Tom gin. An original 1864 recipe for Dry and Old Tom gin found in the Beefeater Distillery confirms this. It lists juniper berries, coriander seed, angelica root, ground liquorice root and winter savoury as the botanical recipe for both Dry and Old Tom Gins. The recipe then specifies the amount of sugar used in the Old Tom version – 40 pounds of loaf sugar for every 100 gallons of spirit. And distillers charged more for it! Around this time the heavy, sweet style of gin had begun to be displaced by unsweetened, clear gin. There were practical reasons for this new development. The invention of continuous distillation first patented in 1830 by Aeneas Coffey, a Dublin Excise Officer, meant that a consistent pure grain spirit at a predetermined strength could now be made cheaply. Gin distillers no longer had to mask the flavours of inferior spirit with sugar and strong spices but instead could focus on creating more sophisticated flavours using botanicals like coriander, cassia, angelica and orris root. These flavours did in fact produce more aromatic and what could be described as ‘dryer’ gins. But lets not forget that gin was now firmly engaged on its upward march towards respectability, attracting new and more middle class drinkers. Canny English distillers were very likely taking a leaf out of the book of their colleagues, the vintners, and describing unsweetened gin as ‘dry’ in much the same way that wine with no residual sugar is described as ‘dry’ or ‘sec’. Much more sophisticated than ‘Unsweetened Gin’ clearly. Add in London where most of the major distillers were based and you have the ultimate in successful strap lines – London Dry. 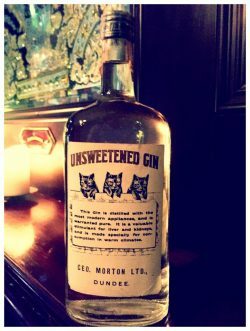 Not everyone got the memo and a look at distillers’ price lists and old bottles demonstrates that for some time gins were listed as Old Tom (aka sweet), Unsweetened, Dry and London Dry. 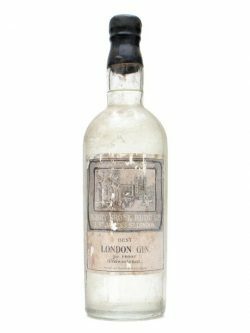 Some distillers covered both options as in this historic Berry Bros & Rudd bottle advertising “Best London Gin – Unsweetened. Naturally too other big distilling centres like Plymouth and Warrington made their own Dry Gins. Over time however, with the regional exceptions mentioned above, London Dry became the catch all name for unsweetened gin and, as of a EU directive of 2008 there are now legal definitions of the different styles of gin mostly designed to protect the tradition and craftsmanship attached to the London Dry style.